You can determine my personal energy level by the complete lack of creativity that went into that title! I've been single-momming it all week while my husband has been traveling for work. I've had a steady headache to keep me company during his absence. Good golly do I need a nap. On the right he has Wheat Thin Stix, the little green cup has cream cheese to dip them in. A chocolate chip granola bite, cheddar cheese stars. And before any robbers or random bad guys get any ideas, my hubby will be back home before the kidlets are in bed tonight! So take that, ha! Where did you get the little green container for the cream cheese? I've been trying to find something small enough for dips to add to my boys Go Green Lunch Boxes but I can't find anything that's small enough, that looks perfect! Awww.. you poor girl! I hate it if my hubby has to leave me for biz trips that is longer than 3 days! I'll go crazy minding the kids alone especially night time as those little monkeys of our are super duper hyper! 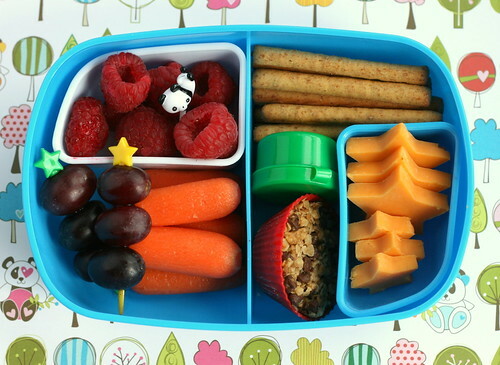 Though your bento is simple but they looked really fresh, healthy and colorful! I'll love to have it! I love how colorful all your bentos are! I'm having a lot of fun making my family's lunches (I actually wake up early because I'm so excited to plan what to make each day), but my son's lunches tend to be blah color-wise. Have to work on that. :-) Hope your headache is better and that you can relax a little when your husband gets home! Great blog! I just started making "lovable lunches" for my daughter. I would love to get your blog to my inbox. If you want to put that option on your blog you can check out my tutorials - I'll be your first e-mail subscriber! Hope you come by and visit my blog! Wheat Thins Sticks - I'm going to keep an eye out for these! I'm looking on the "All things for sale" site for the little green piece you used for the cream cheese but can't seem to find it... Am I missing it? Are there any other similar containers you use for dips, etc? GUESS WHAT! You need to put a super quick update on your blog today. Goodbyn is having a sale. $8 off each lunchbox with code "wendy". I just ordered 3. I've been obsessed with owning three for at least a month now. I'm sure one of your other devoted followers would love to know as well. afroedge - the little cups are listed under the "bento accessory" section, I see them on the 2nd or 3rd page there. If you still are having trouble finding them try putting "mayo cup" in the search box. It should pop right up!